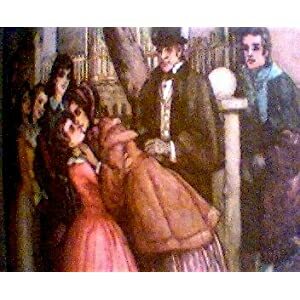 Little Women (or Meg, Jo, Beth and Amy) is a novel by American author Louisa May Alcott (1832–1888). The book was written and set in the Alcott family home, Orchard House, in Concord, Massachusetts. It was published in two volumes in 1868 and 1869. The novel follows the lives of four sisters—Meg, Jo, Beth, and Amy March—and is loosely based on the author's childhood experiences with her three sisters. The first volume was an immediate commercial and critical success, prompting the composition of the book's second volume titled Good Wives, which was successful as well. The publication of the book in the form of a single volume first occurred in 1880. Alcott followed Little Women with two sequels, also featuring the March sisters, Little Men (1871) and Jo's Boys (1886). Little Women has been adapted as a play, a musical, an opera, a film, and animation. Alcott's original work explores the overcoming of character flaws. Many of the chapter titles in this first part are allusions to the allegorical concepts and places in Pilgrim's Progress. When young, the girls played Pilgrim's Progress by taking an imaginary journey through their home. As young women, they agree to continue the figurative journey, using the "guidebooks" — copies of the New Testament, described as "that beautiful old story of the best life ever lived"; they receive on Christmas morning. Each of the March girls must struggle to overcome a character flaw: Meg, vanity; Jo, a hot temper; Beth, shyness; and Amy, selfishness. In the course of the novel, the girls become friends with their next-door neighbor, the teenage boy Laurie. The book depicts the light hearted, often humorous activities of the sisters and their friend, such as creating a newspaper and picnicking, and the various "scrapes" that Jo and Laurie get into. Jo consistently struggles with the boundaries 19th century society placed on females, including not being able to fight in a war, not being able to attend college, and being pressured by her Aunt March to find a suitable husband to take care of her. Josephine "Jo" March: The protagonist of the novel, Jo is an autobiographical depiction of Louisa May Alcott herself. A tomboy, Jo is the second daughter, aged fifteen at the beginning of the story. She is outspoken and has a passion for writing. Her nature often gets her into trouble, while her heart often pushes her into acts of kindness. She is close to her younger sister, Beth, a quiet and compassionate, character who offsets Jo's more outgoing nature. At the beginning of the book, Jo is employed as a companion by her Aunt March, a job she dislikes. When Beth comes down with scarlet fever, Amy replaces Jo as Aunt March's companion. Jo cuts off her long, chestnut brown hair—"her one beauty", as Amy calls it — and sells it to a wig shop to earn travel money for her mother to visit their father, a Civil War chaplain who is dangerously ill. Jo receives a marriage proposal from her girlhood friend and neighbor Laurie, but she refuses him. Later, Jo moves to New York, where she meets Professor Friedrich "Fritz" Bhaer, whom she later marries. Regarding Jo's marriage, Alcott later wrote, "Jo should have remained a literary spinster, but so many enthusiastic young ladies wrote to me clamorously demanding that she should marry Laurie, or somebody, that I didn't dare refuse and out of perversity went and made a funny match for her". In the 1994 film directed by the Australian film director Gillian Armstrong, Jo was portrayed by Winona Ryder. Margaret "Meg" March: At sixteen, she is the oldest sister. She is considered the beauty of the March household and she is well-mannered. Meg runs the household when her mother is absent. Meg also guards Amy from Jo when the two quarrel, just as Jo protects Beth. Meg is employed as a governess for the Kings, a wealthy local family. Because of the genteel social standing of her family, Meg is allowed into society. However, after a few disappointing experiences (first, the Kings' eldest son is disinherited for bad behavior, and later she visits her friend Annie Moffat and discovers that her family believes Mrs. March is plotting to match her with Laurie only to gain his family's wealth), Meg learns that true worth does not lie with money. She falls in love with Mr. John Brooke, Laurie's tutor, whom she marries. Meg bears twin children, Margaret "Daisy" and John Laurence "Demi" (short for Demi-John). In the 1994 film, Meg was portrayed by Trini Alvarado. Elizabeth "Beth" March: Thirteen years old when the novel opens, Beth is a quiet, kind young woman, and a pianist. She enjoys her dolls and cats. Docile and shy, she prefers to be homeschooled and avoids most public situations. At the beginning of the book, Alcott describes her as a sweet girl with a round young face and brown hair. She has a close relationship with Jo, despite their different personalities. Beth enjoys charity work, and helps her mother nurture poor families at the beginning of the novel. Later, when her mother is in Washington caring for their father, Beth comes down with scarlet fever, caught while looking after a family with sick children. Although Jo and Meg do their best to nurse her, Beth becomes so ill that they send for their mother to return home. However, before Mrs. March arrives, Beth's fever breaks. Beth recovers but she is left permanently weakened by the illness. In the second part of the book, as her sisters begin to leave the nest, Beth wonders what will become of her, as all she wants is to remain at home with her parents. When Beth contracts tuberculosis, the family nurses her. In her final illness, she overcomes her quietness when she discusses the spiritual significance of her death to Jo. Some critics have suggested that Beth's death signals Alcott's denial of the ability of the traditional, sentimental heroine to survive in an increasingly industrial world. In the 1994 film, Beth was portrayed by Claire Danes and in the 1978 television movie by Eve Plumb. Amy Curtis March: The youngest sister—age twelve when the story begins—Amy is interested in art. She is described as a pretty girl with curly golden hair and blue eyes. She is dissatisfied with the shape of her nose which she attempts to fix with a clothespin. She is "cool, reserved and worldly" which sometimes causes her trouble. Often "petted" because she is the youngest, she is sometimes vain and spoiled, and throws tantrums when she is unhappy. Her relationship with Jo is sometimes strained, particularly when Amy uses big words, mispronouncing them or using them incorrectly. Their most significant argument occurs when Jo will not allow Amy to accompany Jo and Laurie to the theater. In revenge, Amy finds Jo's unfinished novel and throws it all in the fireplace grate, burning years of work. When Jo discovers this, she boxes Amy's ears and tells her, "I'll never forgive you! Never!" Amy's attempt to apologize to Jo are unsuccessful. When Laurie and Jo go skating, Amy tags along after them, but she arrives at the lake too late to hear Laurie's warning about rotten ice, and Amy falls through the ice, after which Amy and Jo become more close. When Beth is ill with scarlet fever, Amy is sent to stay with Aunt March as a safety precaution. Aunt March grows fond of her, as Amy's natural grace and docility are more to her taste. Amy is invited to accompany Uncle and Aunt Carrol and cousin Flo's as a companion on a European trip. Although she enjoys travelling, after seeing the works of artists such as Michelangelo and Raphael, Amy gives up her art, because she believes herself to be lacking in talent. In Europe, Amy meets up with Laurie, and shortly after Beth dies, they marry. Later, Amy gives birth to daughter Elizabeth (Beth). Amy was portrayed by Kirsten Dunst as a young girl and Samantha Mathis as an adult. Margaret "Marmee" March: The girls' mother and head of household while her husband is away at war. She engages in charitable works and attempts to guide her girls' morals and to shape their characters, usually through experiments. She confesses to Jo (after the argument with Amy) that her temper is as volatile as Jo's own, but that she has learned to control it. In the 1994 film, Marmee was portrayed by Susan Sarandon. Robin "Father" March: Formerly wealthy, it is implied that he helped friends who could not repay a debt, resulting in the family's poverty. A scholar and a minister, he serves as a chaplain for the Union Army. Hannah Mullet: The March family maid. Aunt Josephine March: Mr. March's aunt, a rich widow. She disapproves of the family's poverty and their charitable work. Uncle and Aunt Carrol: Sister and brother-in-law of Mr. March. Theodore "Laurie" Laurence: A rich young man who is a neighbor to the March family. Laurie lives with his overprotective grandfather, Mr. Laurence. Laurie's father eloped with an Italian pianist and was disowned. Both died young, and as an orphan, Laurie was sent to live with his grandfather. Laurie is preparing to enter at Harvard and is being tutored by Mr. John Brooke. Laurie falls in love with Jo and offers to marry her. She refuses, and flees to New York City. Laurie has black eyes, brown skin, curly black hair, and small hands and feet. Mr. James Laurence: A wealthy neighbor to the Marches and Laurie's grandfather. Lonely in his mansion, and often at odds with his high-spirited grandson, he finds comfort in becoming a benefactor to the Marches. He protects the March sisters while their parents are away. He was a friend to Mrs March's father, and admires their charitable works. He develops a special, tender friendship with Beth, who reminds him of his dead granddaughter, and he gives Beth his daughter's piano. John Brooke: During his employment with the Laurences as a tutor to Laurie, he falls in love with Meg. When Laurie leaves for college, Brooks continues his employment with Mr. Laurence as an assistant. He accompanies Mrs. March to Washington D.C. when her husband is ill. When Aunt March overhears Meg rejecting John's declaration of love, she threatens Meg with disinheritance on the basis that Brooke is only interested in Meg's future prospects. Eventually Meg admits her feelings to Brooke, they defy Aunt March (who ends up accepting the marriage), and they are engaged. Brooke serves in the Union Army for a year and invalided home after being wounded. Brooke marries Meg a few years later when the war has ended and she has turned twenty. The Hummels: A poor German family consisting of a widowed mother and seven children. Marmee and the girls help them by bringing food, firewood, blankets and other comforts. Three of the children die of scarlet fever and Beth contracts it while caring for them. The Kings: A wealthy family who employs Meg as a governess. The Gardiners: Wealthy friends of Meg's. The Gardiners are portrayed as goodhearted but vapid. Mrs. Kirke: A friend of Mrs March's who runs a boarding house in New York. She employs Jo as governess to her two girls. Professor Friedrich "Fritz" Bhaer: A poor German immigrant who was a professor in Berlin but now lives in Mrs. Kirke's boarding house and tutors her children. He and Jo become friendly and he critiques Jo's writing, encouraging her to become a serious writer instead of writing "sensation" stories for weekly tabloids. The two eventually marry, raise Fritz's two orphaned nephews, Franz and Emil, and their own sons, Robin and Teddy. Franz and Emil: Mr. Bhaer's two nephews whom he looks after following the death of his sister. Tina: The small daughter of Mrs. Kirke's French washerwoman: she is a favorite of Professor Bhaer's. Miss Norton: A worldly tenant living in Mrs. Kirke's boarding house. She occasionally takes Jo under her wing and entertains her.